Miss Fancybelle: Knitting--Bring it On!! I'm Featured on Handmade Highway! New Girly Girly Baby Blocks Available Today! Who Wants a Pretty Wrist Pin Cushion? Shop Notes & Free Shipping Offer! My sweet baby girl, Lucy Belle, playing with her new set of Girly Girl Baby Blocks! 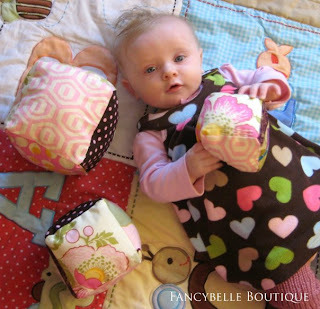 Here is the set that is listed in my store: Girly Girl Baby Blocks in Designer Fabrics. I'm selling these "baby legs" style leg warmers at a special introductory price of only $9.50. Quite the steal, considering the time investment that is involved compared to sewing baby legs--that only takes 5 minutes! Later today I'm going to post a giveaway prize for my Facebook fans, a brand new Baby Belle cloth doll. So new, I haven't even picked out a name for her yet. Guess I better get on that. For your entry to win, just select "become a fan" on the Fancybelle Boutique Facebook page.